Targets areas at risk of decline as we age including, but not limited to, the hips and legs, the spine and balance. Which Pilates Instructional Video is right for you? Teresa is uniquely qualified as a Pilates instructor. A combined total of 30 yrs of Dance, Pilates and Physical Therapy experience informs her integrated approach to the art and science of helping people find ease and joy in movement. BoneSmart Pilates is more than an exercise system. Age strong in a supportive community! Find positivity in all of Teresa’s classes as well as in her DVD’s. Join a moderated, private support forum, free to all DVD purchasers, that provides a safe haven to ask all your exercise related questions. See three top core exercises proven to help you age strong! View the A, B, C’s (Alignment, Balance and muscle Contraction) of the BoneSmart Pilates® Method. Exclusive Free Bonus for BoneSmart DVD owners. Enjoy additional guidance and feedback to get the most out of your DVD. If we’re sedentary as we age, we will lose flexibility, strength, bone density and balance. This makes us vulnerable to injury. It doesn’t have to be this way. 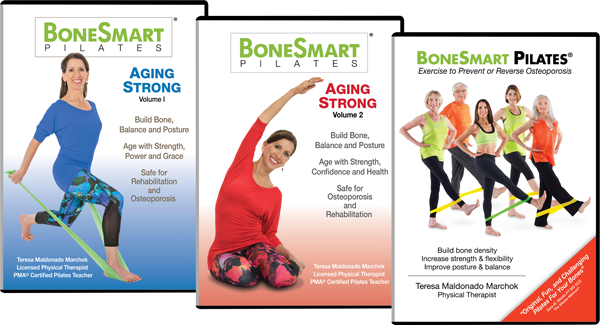 BoneSmart Pilates revitalizes the aging body and safely addresses problem areas associated with aging such as the back, neck, foot, shoulder and knee. If you have osteoporosis or osteopenia, BoneSmart Pilates will help you to improve your posture, build bone safely, and avoid movements that increase fracture risk. No matter your age or current fitness level, BoneSmart Pilates will increase your mobility, strength and balance—which will help you enjoy life to its fullest for many years to come!